In Colorado, locals have a summer passion for climbing fourteeners, mountains taller than 14,000 feet. In fact, Colorado has more than 50 fourteeners! Over this past weekend, my husband and I thought we would be adventurous and give Mt. Elbert a shot; at 14,433 feet it is the tallest mountain in the Rockies. It was a strenuous climb that took us a total of seven and a half hours, but the summit view was well worth it! One of the necessities of taking on any strenuous activity is fueling the body. When hiking, biking, running, or partaking in any activity for an extended period, the body needs energy from carbohydrates to keep going. Glucose, the primary energy source used by the body, is stored in the liver and muscles and circulates in the blood to continually fuel the tissues. This energy allows the muscles and organs to help you up the mountain or down the road. After a while, if immediate stores of glucose are exhausted, you may feel sluggish and have difficulty continuing. This is what exercise professionals call “hitting the wall;” it means the body has run out of easily accessible energy, and needs a quick boost to keep going. Indeed, fruit is a great choice for refueling when active. Like most fruit, pears contain a healthy dose of energy – about 100 calories per medium pear. Pears contain small amounts of potassium and other electrolytes, nutrients required for muscle contraction that are lost during perspiration. As well, pears contain micronutrients that aid the body’s fuel cycle. Additionally, pears are portable and make an easy take along snack for any activity. They are compact, fresh and palate-pleasing, leave little waste to carry, and travel well. Along the route to the top of Mt. Elbert, we took several breaks to rest, rehydrate, and refuel. We brought many energizing snacks, but the most refreshing were definitely the Red Bartlett pears we munched on the summit. After about four and a half hours to reach the top, parched and hungry, we relaxed, reveled in the view, and relished every bite of our succulent pears. Indeed, at that moment, nothing could have tasted better. So the next time you head out the door for some summer fun and need a quick and refreshing burst of energy, pack a pear for pep! P.S. If you’re worried about squishing your nice, ripe pear when you’re on the go, we have just the solution! Our sturdy and reusable Pear Packer lets you pack fresh, ready to eat pears in school lunches, briefcases, backpacks and more. They eliminate the “squish factor” that ready to eat pears can suffer when taken on the go, and are made from recyclable plastic. The first five people to leave a comment on this post will be contacted and sent a FREE set of four Pear Packers! What are you waiting for? Leave us a comment! This entry was posted in Nutrition, USA Pears Contests and tagged Amy, athlete, Nutrition, pear packers, pears by Amy Kweller MS, RD. Bookmark the permalink. Pears are just SO AWESOME!!!!!!!! I eat a pear just to climb out of bed. so I can start another day. sigh…too little too late, but i think the pear protector is a fabulous idea! how come it took someone this long to think this up? i have lived with squashed pears in lunches for far too long….thank whoever did this bit of brilliance. maybe you will decide that 5 responders was just not quite enough. anyway, the hope of it means perfect pears anytime! yahoo! Thank you for your comment! We would be happy to send you some pear packers! Email me at jsullivan@usapears.com with your mailing address and I’ll get them right out! i love pears and so does my daughter, but when she takes them to school they end up bruised and squished. this would be our PERFECT solution to getting her to eat more fruit during the day! Hi Judy! Thanks for the comment! We’ll gladly send you a pear packer for your daughter. Just send me an email with your mailing address (jsullivan@usapears.com). I am a teacher and received a pear packer last year. I teach English as an Additional Language students and we are doing a project on fruit right now, I thought that it would be a great idea to give them some pear packers as part of the lesson, where can I buy some? Hi, Melanie! Your pear packers will be on the way soon! For future reference, pear packers ARE sold online. You can find them at: usapearsmarketplace.org. My wife and I have enjoyed unscathed, juicy and pristine pears in our lunches and hiking excursions for well over the past year thanks to our pair (haha) of pear protectors! Unfortunately one has gone missing (we perhaps flaunted our pear protectors too much in front of friends, family and coworkers and it disappeared via the five finger discount) and the other won’t close now (we’ve started using masking tape) as someone who shall remain nameless (me) might have put it in the dishwasher… This product is the greatest thing since sliced bread… Or sliced pear! How do you purchase pear packers? 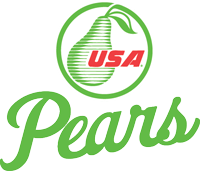 You can purchase pear packers at our Marketplace. Check it out at http://www.usapearsmarketplace.org.